On the 11th hour of the 11th day of the 11th month of 2018, the Santa Cruz clock tower tolled to mark 100 years since the end of World War I, known as Armistice Day. Timing his strikes with the tower’s, Vietnam War veteran and Santa Cruz resident Rico Baker rang a handheld bell crafted from a spent artillery shell before sharing a moment of silence with a crowd of about 40. Before the tower, a small assemblage of veterans, community members and government officials gathered to observe the solemn occasion. The Armistice Day event included performances by folk singers Steve Bare and Keith Greeninger along with Santa Cruz Pipes and Drums, a bagpipe ensemble. The gathering was meant to celebrate peace in a time fraught with war. Officials from the city, county and U.S. Congress made speeches to the gathered townsfolk. Mayor David Terrazas delivered an official proclamation on behalf of the city, urging the people of Santa Cruz to re-establish a national holiday dedicated to peace. 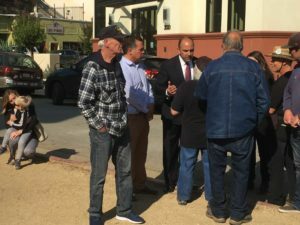 When Congressman Jimmy Panetta (D-CA 20th) took to the mic, however, some members of the crowd immediately shifted the focus to Panetta’s voting record. Jeff Rudisill confronts congressman Jimmy Panetta over his ‘yes’ vote on the 2019 National Defense Authorization Act. Rudisill and others vocally denounced Panetta’s vote throughout Panetta’s speech. Specifically, they raised vocal objections to his vote in favor of the 2019 National Defense Authorization Act, a $717 billion military spending bill signed into law last August, leading to a tense exchange. Panetta eventually began his prepared remarks while talking over the objectors. Shortly before the disruption, a group of veterans arrived at the demonstration. Welcomed by a renewed fanfare of bagpipes and calling themselves the March for Change, the group had marched from Watsonville to Santa Cruz, a distance of about 22 miles. They chose the 22-mile distance to symbolize and raise awareness of the fact each day, 22 veterans will take their own lives. Veterans with the March for Change cross Water Street at Pacific Avenue. 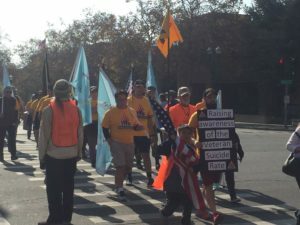 The group marched to raise awareness of veteran suicides, and made a two week march to Sacramento four years ago. Event officiator and Santa Cruz resident Tatanka Bricca said about 125,000 U.S. veterans died by suicide since 1999, compared with about 5,700 who died in combat. After honoring the marchers and veterans from all wars, the congregants made their way across the street to the World War I memorial. There, David Terrazas laid a flower wreath before the memorial, which stands in remembrance of the 45 Santa Cruz residents who died fighting in WWI. After the wreath laying, various workshops and talks about fostering peace locally and abroad lasted into the evening. 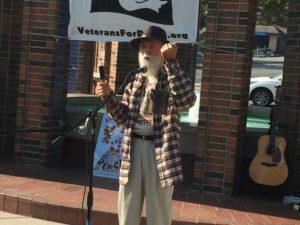 “Our program here […] is a call with suggestions being offered on how we can realistically and effectively turn this huge ship of insane militarism back around to the true spirit of Armistice,” said Vietnam War veteran and Santa Cruz resident Rico Baker.